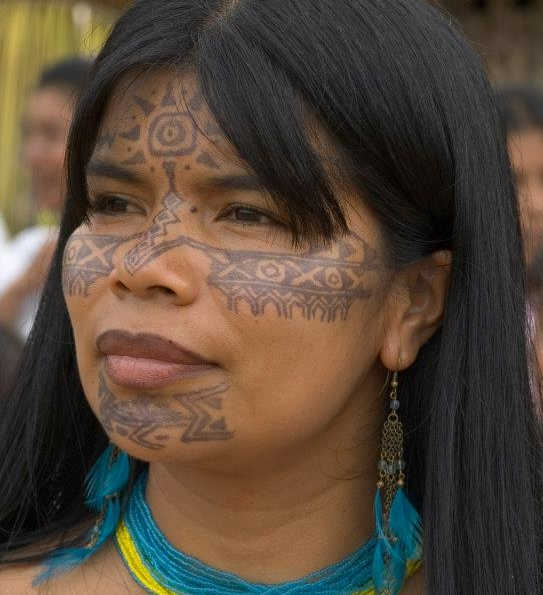 “While others had to give up, Sarayaku will never surrender,” said Patricia Gualinga, the former speaker of the indigenous Kichwa community Sarayaku, in a conversation with Amazon Watch in 2013. The community is known world-wide for its successful battle against the invasion of international oil companies into their territory for the drilling of oil, gas, and minerals. Patricia Gualinga puts the fight for territory and the desire to live in harmony with nature into a larger context of international efforts to achieve a more sustainable future. The conservation of traditions and rich cultural identities and the approach towards so-called modernity give rise to an indispensable dialogue and exchange during a time at the crossroads. As the speaker of the village and a role model for a lot of women in the preservation of the rain forest, her feminist perspective important, too. The marriage of narratives and reports by Patricia Gualinga and the passionate music by Grupo Sal creates a unique collage, which informs, questions, encourages discussions, touches and moves. The history of Sarayaku invites us to question the current destructive ways of living and doing business. We get an insight into a special relationship between man and nature by engaging in the dialogue with indigenous people, an insight mostly lost in wealthy nations. The music of Grupo Sal is not merely an accompaniment. The music is interwoven with the talk and thus becomes a main element of the evening, too. The artistic approach allows for a unique and sensual access to the essence of the programme. The interplay of music and presentations creates an unforgettable, captivating atmosphere. The moderator and translator Isabelle Radhuber contributes to the programme with her own perspective, her well-founded expert knowledge, and her extensive experience. Her political and subject-specific ideas add to the debate which may also contain interactive elements with the audience.